Featuring my Specialty Gourmet Packages designed specially for YOU! Enjoy FREE Shipping on all Gourmet Product Packages! Like to mix and match your own selections? Click here! Chef Chasky’s “Mac Daddy” EVERYTHING PACKAGE! 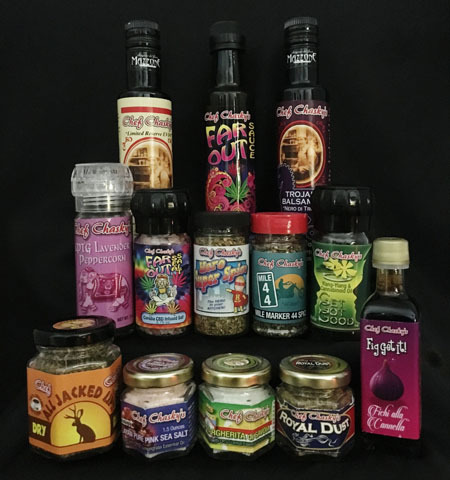 All 13 of Chef Chasky’s Gourmet Products! View details of all gourmet products! Chef Chasky’s famous Lavender Pepper infused with pure Lavender from Bulgaria, 5th Element Himalayan Pink Sea Salt hailing 84 trace minerals and Lemongrass from India, GetGotGood Pepper featuring Yylang, Yylang & Cannabinoid Copaiba, Margherita di Savoia infused with pure Lemon from Sicily and our outrageous Far Out Salt Rock Salt & Grinder, infused with our Cannabinoid Copaiba harvested from the Amazon Forest in Brazil! 2 bottles of Chef Chasky’s Limited Reserve EVOO, boasting 600mg of polyphenols with this harvest and a high smoke point of 420 degrees Fahrenheit, because the Cortina Olive trees are 500-1,000 years old and not one, but 2 bottles of Chef Chasky’s Nero di Troia balsamic vinegar made from the black grape from Greece brought into Italy during the Trojan Period. Imported from the family farm in Puglia, Italy this package is sure to please! 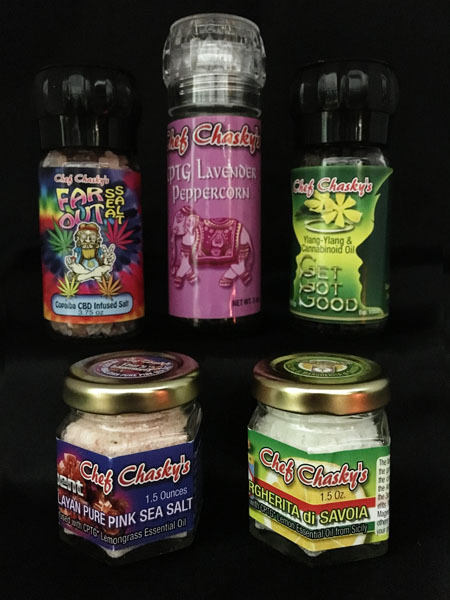 In your Far-Out Package you get: 2 Far Out Pink Himalayan Rock Sea Salt & Grinders, combined with 2 bottles of Chef Chasky’s Far Out Sauce (made with 5 of our gourmet products and 4 CPTG- Certified Pure Therapeutic Grade, above organic digestible Essential Oils), combined with not one but 2 GetGotGood Peppers & Grinders, which hails two of our most popular CPTG Oils Yylang, Yylang (known to enhance libido) & our Cannabinoid Copaiba. This Package is as Therapeutic in nature as it is Satisfying for ALL! 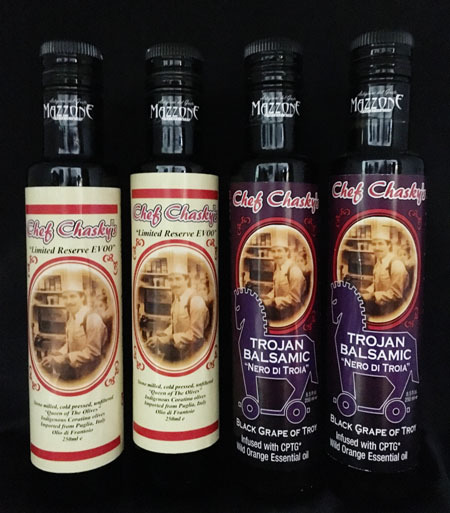 You receive 2 bottles of Chef Chasky’s Limited Reserve EVOO, boasting 600mg of polyphenols with this harvest and a high smoke point of 420 degrees Fahrenheit, 2 bottles of Chef Chasky’s Nero di Troia balsamic vinegar made from the black grape from Greece brought into Italy during the Trojan Period. 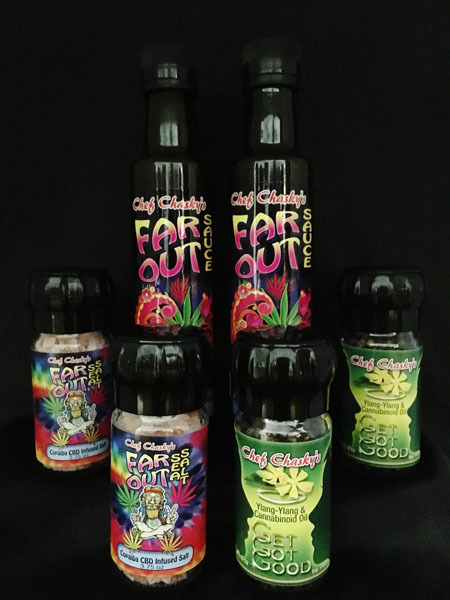 Imported from the family farm in Puglia, Italy and 2 jars of Chef Chasky’s “Royal Dust” Dry Rub Seasonings a “one of its kind’ in taste and therapeutic value. As It boasts 14 flash dehydrated organic mushrooms and half an ounce of Bottarga Caviar. Treat yourself like the Royal that you are or gift it to the King or Queen in your life! Great on Caprese, Bruschetta, Heirloom tomatoes, Crostini or freshly baked bread. 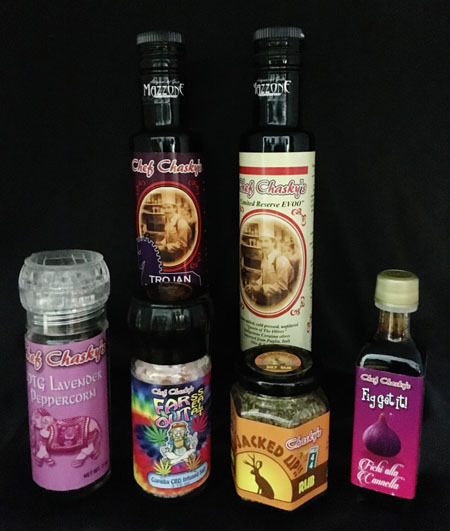 In this six item Grill Lovers cornucopia, you receive, 5 of Chef Chasky’s Gourmet products including 1 secret recipe! 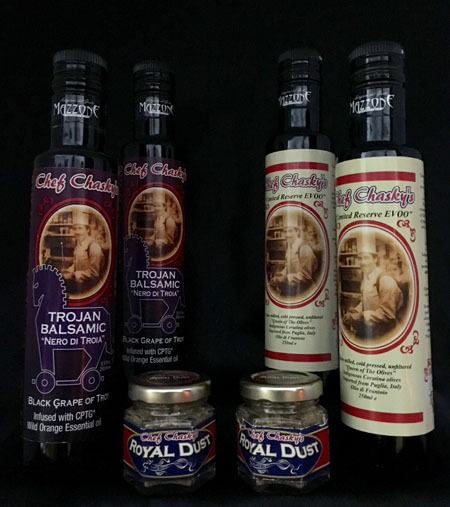 He has combined for you his All Jacked Up Dry Rub, Far Out Salt, Limited Reserve EVOO, Lavender Pepper, Chef Chasky’s Trojan Balsamic Vinegar “Nero di Troia” and the famously Fig Get it as your finishing sauce!